I'm excited that this is probably the last post on our farmhouse progress! We passed our final inspection and are moving in! Can you believe it? In some ways it seems like it took us forever to build our home; in other ways it seems like it was incredibly fast. 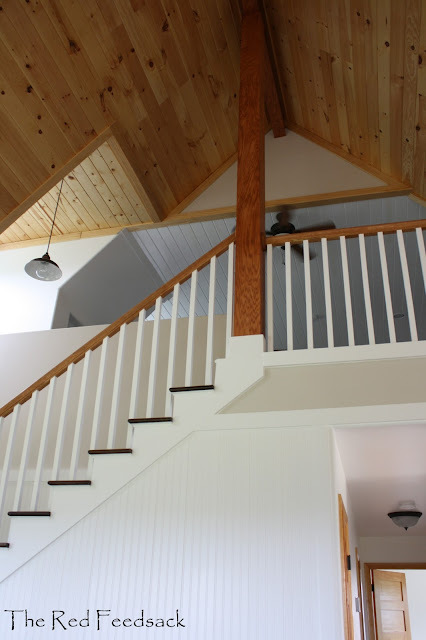 We still have closets that need shelves, a laundry room that needs shelves and a custom pantry cabinet, and my barn room upstairs that needs shelves in the built-ins, BUT those are all things we can now work on in our leisure while we enjoy living in our house! I'd like to tell you about our stairs. 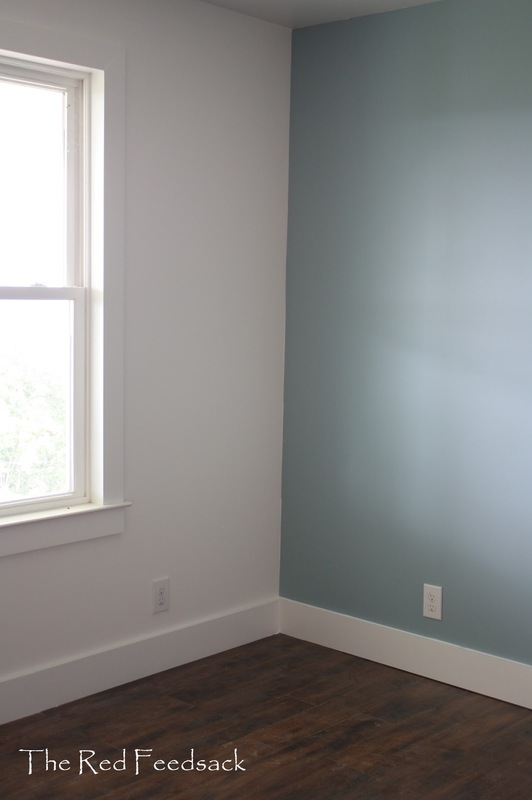 There's a whole, whole, whole lot of stuff I've learned in building a house. 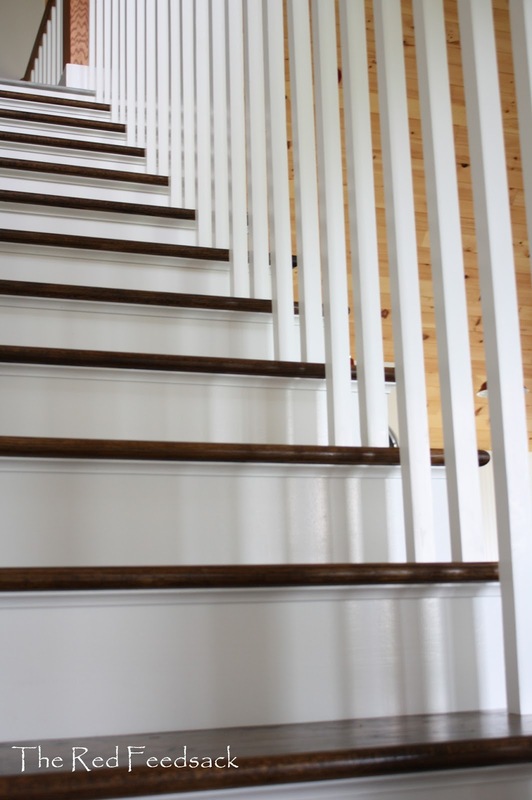 Way too much to even list, but I sure realized that I didn't know anything about stairs! For example, I learned the names of all the parts! I also learned that every single thing about the stairs must be to the building code in your State as it is a huge safety factor - and in the final house inspection they will check everything about your stairs... and ignore other things that seemed way more important! 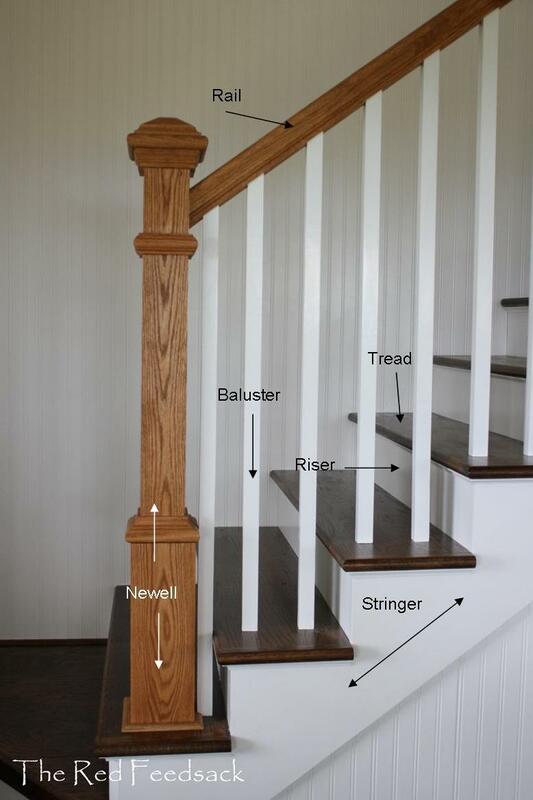 With having an Engineer for a husband you can just imagine how much thought and work went into our stairs. I was pretty much wondering why we thought we needed an upstairs! But, the biggest dilema of all for me was wondering what color to stain/paint the stringer, stain/paint the treads, stain/paint the risers, stain/paint the newell and the rail, and stain/paint the balusters! 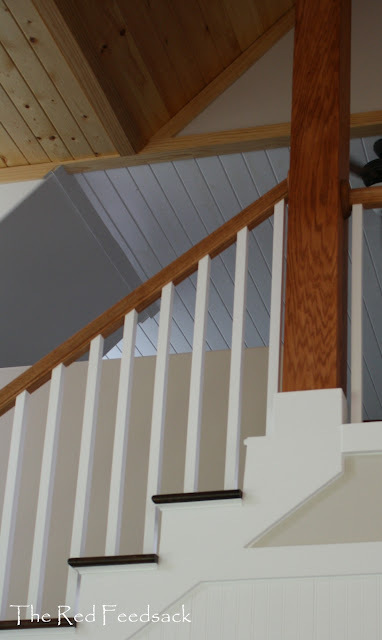 This was the problem: we have a lot of different woods in our house: pine ceiling, birch butcher block counter tops, pine interior doors, oak beam and pillar (which the rail would actually attach to). Not to mention the driftwood laminate floor at the top of the stairs and the walnut laminate floor at the bottom! 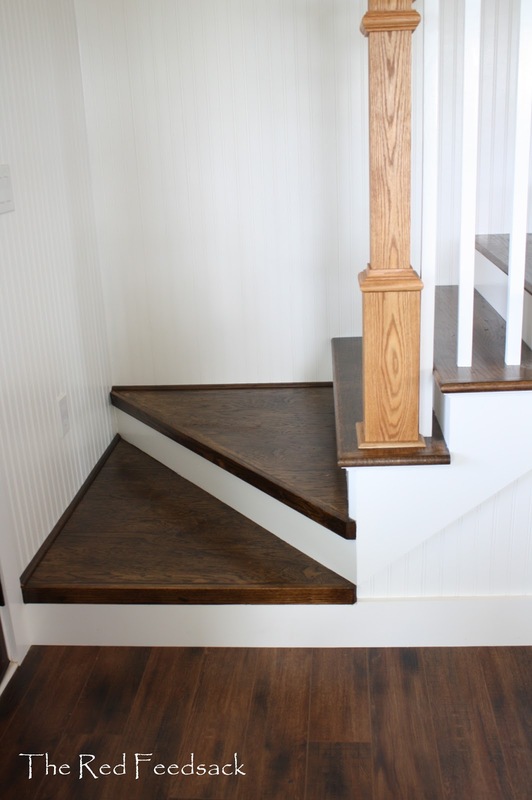 So how do you finish stairs when you have all those factors already in place? 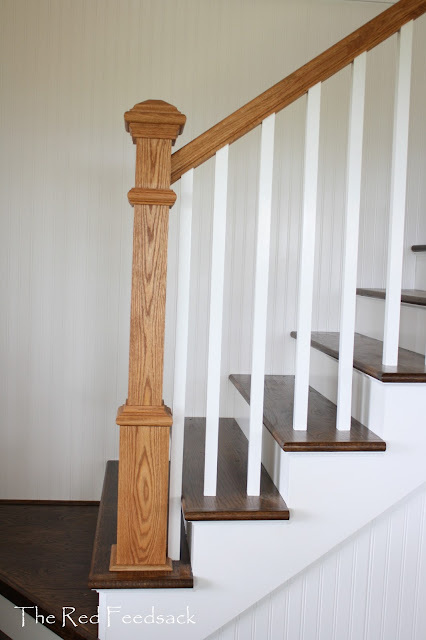 Its all about compromise and here it is: white painted stringer to match the beadboard walls, walnut stained treads to match the flooring on the downstairs, white painted balusters to match the walls and the stringer, oak stained newell and rail to match the pillar, and white painted risers to give contrast. 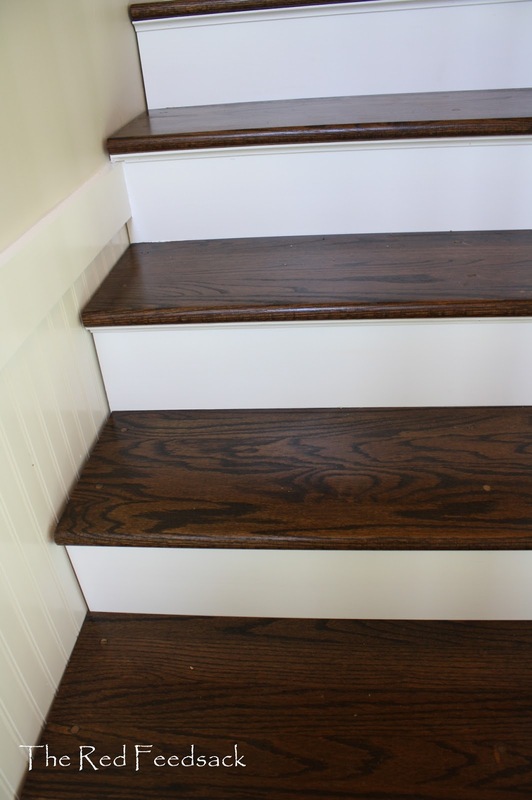 When I first started staining the treads I got a little sick to my stomach - it seemed so dark and such a contrast to the oak that I thought it looked terrible. Nothing to do but just proceed though. Then all of a sudden a really weird thing happened - I fell in love with them. The overall look was so gorgeous that I decided all those crazy wood tones actually all went together beautifully. Even tying the final riser into the driftwood laminate ended up looking just fine. 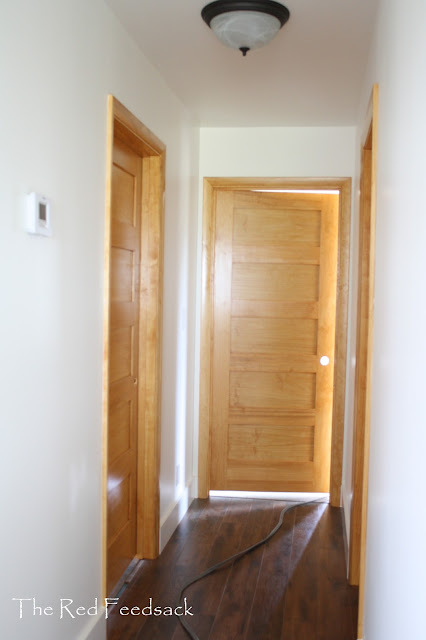 The next big chore in recent weeks has been the interior doors. Eldon was set on solid wood doors and I was set on the five panel old farmhouse look. We ordered them, they were delivered and they were beautiful. Somehow I guess I just didn't really let myself think about the amount of work that prepping, sanding, staining, varnishing, sanding, varnishing, sanding, varnishing, (and into infinity it seemed like) it would be. It was ridiculous. I think I could safely say it was the most tedious job I've done in the house! But, the good news is that I finally finished, Eldon hung them all and they look great. I'm so glad we went with the solid wood and I really love the look of the five panel. The hardware was installed on our vanities, as well as the vanity tops, sinks and faucets. I had the latches and knobs put on both vanities and I really love the look. All floor board trim and final painting complete! Because of living on a hill, we have to use a pump to get water up to our house. We've had a water line and electrical line from the pump right to our travel trailer and now we are extending both lines to the house. So today we got the water snubbed in and worked out a few kinks and Eldon will start on the pump electrical this week. But the good thing is that it allows me time to move in slowly and really enjoy the process! I was pleasantly suprised at how much room there is in just one of the cabinets under my island! 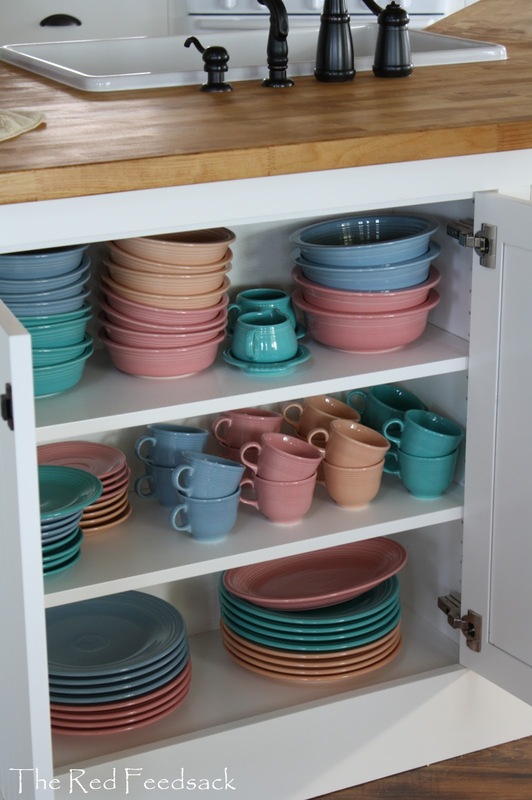 I could fit this entire 16 place setting of my vintage Fiestaware in one cabinet. I want to give a big thank you to everyone that has read my blog and kept up with our farmhouse progress. The emails and comments of encouragement mean a whole lot to us! Oftentimes it is what has kept us trudging through! If you haven't entered my giveaway from last week's post, there's still 2 more days. You can enter here by leaving a comment on the post. And come back again next week as I want to tell you all about my Pfister kitchen faucet and I have a surprise give-away planned! How exciting! You are moving in! Everything looks wonderful. I envy those five-panel doors. I am looking forward to the final reveal. Dori, your house is beautiful! I know you and your husband are enjoying the process of moving in. Every detail is perfect and beautiful! Beautiful Beautiful Beautiful! Just Perfect! Simply magnificent!!!!! Love love love it all. I think I say this every time I comment...but oh my goodness! It's finally happening. You've worked so hard and I'm so, so happy for you. Can't wait to see what you do with that upstairs! 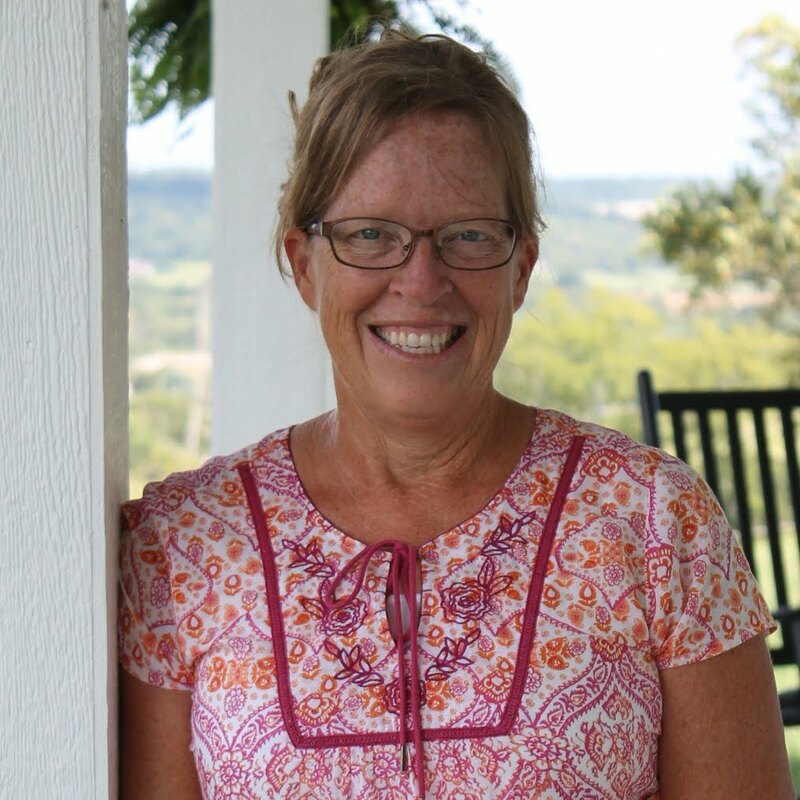 I've "loved" following the progress on your new farmhouse! It's beautiful! Thanks for sharing with all of us! Every decision you both have made it wonderful.It's all beautiful! Moving in is always so exciting! definitely be the inspiration to follow. Thank you for sharing. Love the different stains and wood colors! It makes a house a home-your decisions and choices-beautiful! Do enjoy the moving in process-you have earned it! I am soooooooooo excited for you!! I know this has been a LOT of work, and I can only imagine the satisfaction you must have of moving into an AMAZING beautiful house that you put all of that work into! And I LOOOOOOOOOOVE your Fiesta ware and your 5 panel doors and everything else about your new home, and you! I so admire your patience for all those details and tedious work, and now look what you get out of it! WAAAAAHOOOOOO!!!!!! Dori your house is just stunning. Those stairs just take my breath away. Hmmmmmm I wonder if I can get my stairs done. . .
Now that you're all moved in, you just won't know what to do with all your spare time.. right? And, since you're such experienced and skilled professionals, y'all can just come to TX for a couple months and completely redo my house... all on a shoestring budget of course. The walnut with white contrast is awesome! Actually ALL of it is. 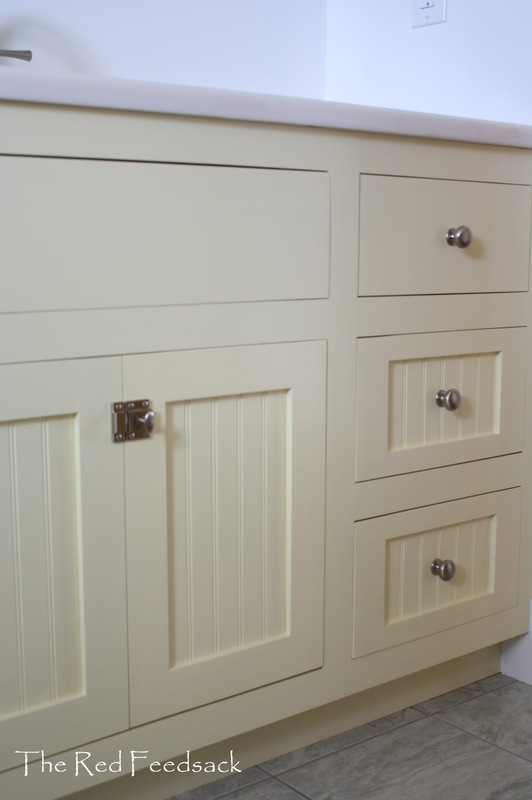 I absolutely love all the latches and pulls on the bathroom cabinets and in the kitchen. I love the real wooden doors and the six panels, gives it an old fram house look. Looks like you have so much cabinet space in your kitchen. I thought I did but I have filled it up too quickly! Everything about your house is beautiful! 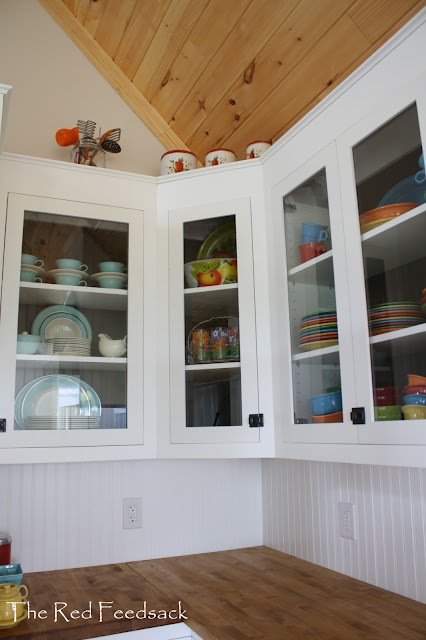 Love all the dishes in your cabinets and especially the red and white canisters sitting on top! Brings back lots of good memories. I have been following your progress for awhile now and I am so excited for you! Congratulations on a home well done! The different types and colors of wood all go together beautifully. I think everyone's design style is starting to relax and not get all caught up in matchy-matchy. 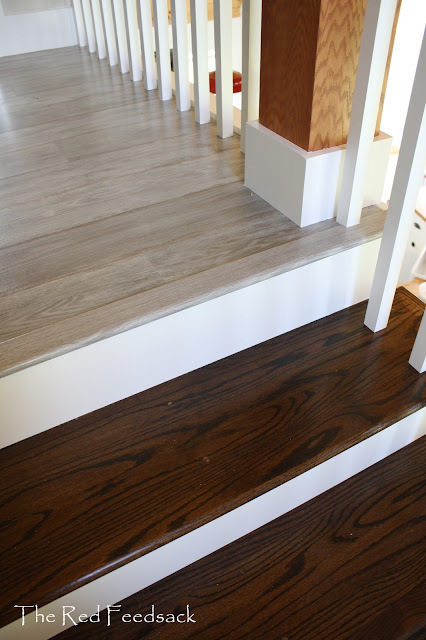 The different tones of wood all play off each other and really compliment each other. Your kitchen cabinets are wonderful! The open storage look is really in right now but I think the glass paned cabinets are the absolute best option because who wants to dust all those dishes?! The 5 panel doors are pretty fabulous too. 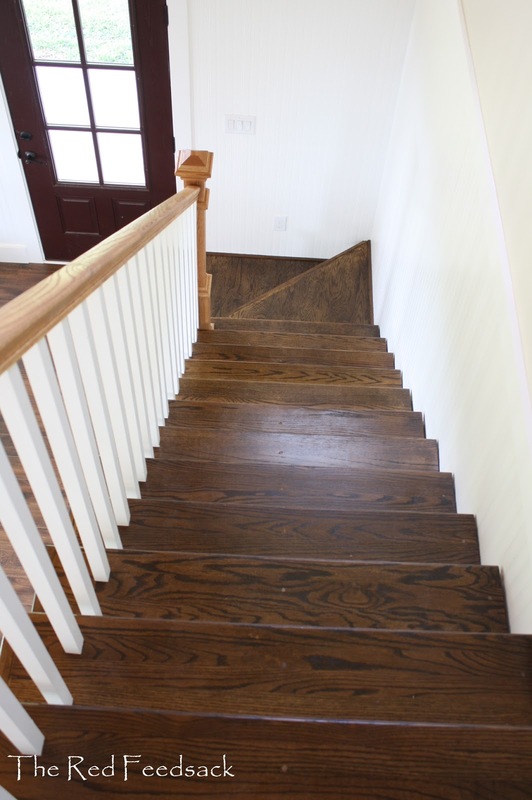 I'm really enjoying your blog and your adventure in house building! It's just beautiful Dori - so glad the move in day is here. Enjoy your new absolutely beautiful farmhouse! You all did an amazing job! Dori, your house is beautiful..and everytime I look at your photos and read, I can only imagine how long the process on certain things must have felt.. But you have made it to the finish line.. and what a glorious moment I am sure it was when you were able to start moving in.. and slowly is best.. Thanks for sharing this journey and you are an inspiration.. Hooray!!! A thousand times, hooray!!! It's beautiful and I am so happy you are in!!! I have loved watching the process and learning how amazingly talented you and your husband are. Dori, I am so behind on blogging or reading blogs. My brain is like mush so I can't remember if I told you our son is getting married in our back yard on Sept. 7 - 11 days to go! Then a week ago, Sunday, my MIL passed away. Airline tickets were ridiculously expensive so we drove 1450 miles in two days to attend the funeral and turned around and drove home. I am beyond exhausted. That said, I look forward to enjoying your blog and catching up when things settle down here sometime in late September :) So happy you are about to move in your wonderful home. Dori, you and Eldon should feel very accomplished. I am so happy for you. This is absolutely beautiful! And what's more, every inch has you in it. I love it! Your attention to detail is obvious, and it has all turned out beautifully. 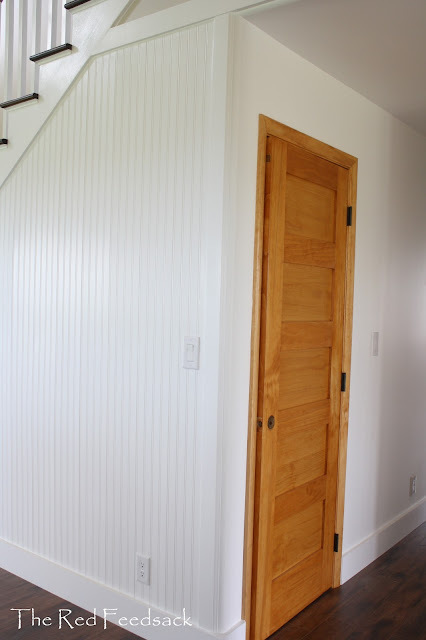 I love the interior panel doors and wondered if you might share a link or the source. I look forward to seeing more photos of your home in the future! I love the latches on your bathroom cabinets. Could you tell me your source for those?? I'm so sorry that I do not have a source for those exact ones. The cabinet shop that custom built our cabinets supplied those. I will say this though. There are a lot of places on internet that you can purchase cabinet latches. However, do NOT buy inexpensive ones. You want to spend the money and get the good ones; it is worth it. I do know that they cost up to $20 each. Good ones are not cheap! Just the simple but very efficient way you did. I love this idea so much. Thanks for sharing. Hope you'll keep posting. Its all so wonderful! I love the stair dilemma cause it's so true how much thought goes in to something that originally sounded like a simple decision, what you came up with is beautiful! Wood stain is something I struggle with a lot. I'm hoping to get into wood work but have a long way to go to get comfortable with it! The 5 panel doors are beautiful! It's what I was hoping to put in ours, but solid wood doors didn't fit into our budget and they didn't have that style available yet... "Available in 2016"...no timeframe though! Go figure! Hahha but I love the 3 panels!